You have to feel bad for Sony Pictures right now. No matter how you view their handling of recent events, it’s undeniable that they’re not in the best place right now, with most of the world looking down on them with disgrace – hell, even President Obama called their actions “a mistake”, which has got to hurt anybody working there right to the core. It’s obvious that what Sony needs right now is something that can get everybody smiling again, something that can convince the masses that they can still house a competent project, something that – for all intents and purposes – can make everyone forget all of their troubles and just enjoy their time at the movies. Annie is not that something. 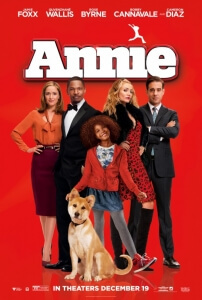 This updated version of the popular musical, itself based on the Little Orphan Annie comic strip and previously made into a musical film starring Carol Burnett and Albert Finney, does little to entertain anyone over the age of five… and even then, five year olds wouldn’t enjoy this film that much. The musical itself may not have been a classic among the ranks of West Side Story, Les Miserables or any of the other classics, but there was still a hint of charm that spoke to audiences in whatever way they felt comfortable which, sad to say, is not present at any time during this film. It feels like a corporate product from beginning to end, the combination of studio heads and hip-hop producers like Jay-Z and Will Smith creating a blank product which they slap a recognisable name onto and try to sell to the masses under that name. No room for charm or even likability, with “sell, sell, sell” stuck on endless repeat in its mind and offering nothing in terms of story, character or even musical numbers to compliment the people paying to see the damn thing. The story may have been adapted into a modern and contemporary setting (the musical had previously been set at the height of the Great Depression in the 1930s), but it’s still the same basic “cold rich a-hole learns to love a child” schtick we’ve seen time and time again not just in previous versions of Annie but other family films with similar plots. The decision to wipe away racial boundaries and cast black actors in the title role (Oscar-nominee Quvenzhané Wallis) and as major supporting character Will Stacks née Daddy Warbucks (Oscar-winner Jamie Foxx) is a fine decision in these more accepting times, though it adds nothing to the overall impact of the story (not that the colour of one’s skin should matter anyway). Upgrading Annie from a girl in an orphanage to a foster child also seems more in line with today’s view of the world, as does the addition of Bobby Cannavale’s sleazy publicist, desperate for his client Stacks’ rise in the polls of a mayoral campaign. But no matter what little additions they’ve added to the proceedings, it’ still the same sickly-sweet and dumbed-down clichéd plot we’re all sick to death of. If only the updates could have been reserved for fixing those tired tropes, or even many of the plot holes that emerge as the film goes on – like, how do they even find out who Annie is or where she lives when Stacks saves her from being run over near the beginning? Unless there was FBI-style stalking involved, the motives are very questionable indeed. The characters are still the dullards we know them to be, but for whatever reason none of the actors cast in the film don’t even seem to try and give life to them – aside from Wallis, who manages to do fine despite what she’s given as material. Everyone else, on the other hand, is extremely forgettable; Foxx is on standby mode, while Cannavale feels lost without the right direction by Easy A’s Will Gluck. But the worst one of all is Cameron Diaz, horrendously miscast as breakout character Miss Hannigan and giving one of the weakest performances of her career, portraying the alcoholic character like how an child would envision acting drunk and going further than over-the-top with the subtle nature as a slap to the face. It’s actually hard to watch her be so bad in this role, and this is coming from someone who does genuinely like Diaz in a lot of other stuff. Even her singing is uncomfortable, which to be fair may have been the point (after all, she IS meant to be drunk) but will cause internal bleeding regardless. As for the musical numbers, for some reason they have been given a more R’n’B feel to them which makes them sound more like rejected songs from a Beyoncé album and less like an actual movie musical. The most popular ditties, “It’s A Hard Knock Life” and “Tomorrow”, are gotten out of the way very quickly early on and aside from instrumental beats later on in the film leave just as fast as they came, leaving us with the less memorable tunes to take up the remainder of the running time. Some of the newer additions, such as a Golden Globe-nominated Wallis solo entitled “Opportunity”, can be nice to listen to albeit with a few too many rubbish lyrics but overall, as a movie musical, it fails to do justice to the medium. As for Sony, their current problems sadly cannot be helped by the release of this movie; if anything, the world will think even less of them for corporatizing a fairly popular musical just to make some money. While it’s not quite on the grander scale of things, fans of Annie should definitely feel betrayed and saddened by what organisation their favourite little orphan has been adopted by. Annie is nothing more than a corporate cash-in of a popular musical, displaying none of the original’s charm or sweetness and instead replacing it with something more robotic with equally artificial performances by the majority of its cast (including Cameron Diaz’s stunningly-awful presence here) and forgettable musical numbers. It’s definitely the hard-knock life for Sony, the audience, and the cast and crew of this woeful adaptation.